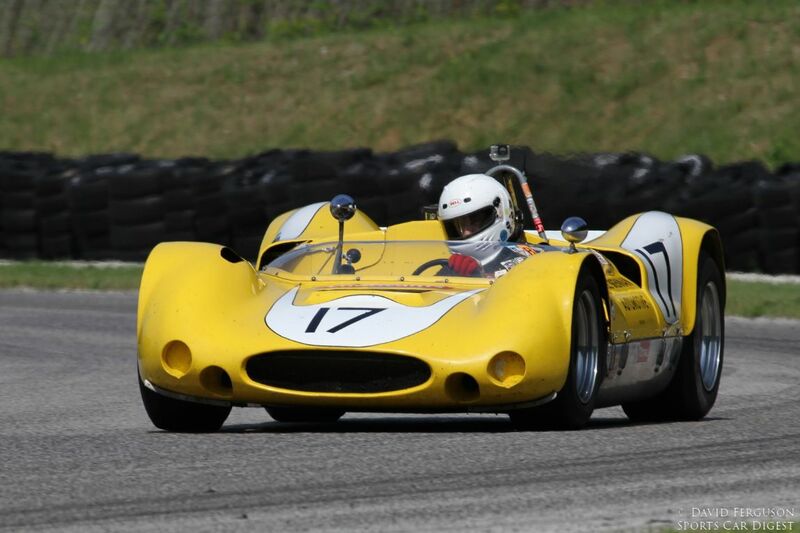 The Hawk at Road America with Brian Redman was held July 17-20, 2014 at the famed 4-mile, 14-turn Road America road course in Elkhart Lake, Wisconsin. Nestled in the Kettle Moraine region of Wisconsin, about an hour’s drive north of Milwaukee, Road America is one of the prettiest tracks in the United States. Postcard perfect weather greeted the nearly 450 entrants at this year’s vintage race, formerly known as the Kohler International Challenge or KIC. 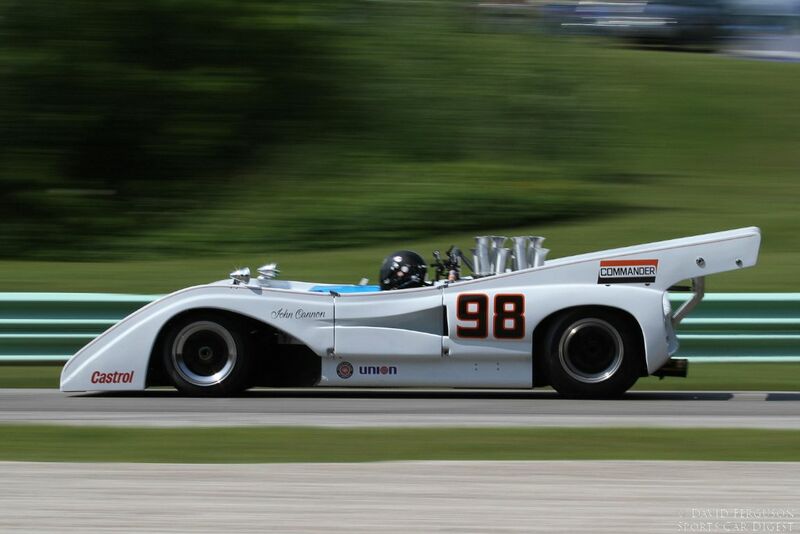 Can-Am cars from 1965 through 1974 were a featured race at the 2014 Hawk at Road America with Brian Redman, and 27 of them showed up to race. 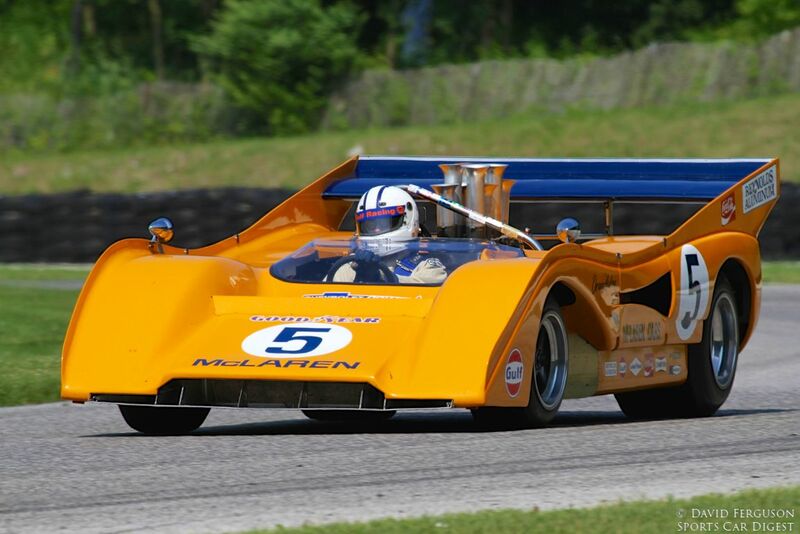 Chris MacAllister’s 1971 McLaren M8F was the class of the field, handily winning over Lolas, McLarens, McKees and Genies. 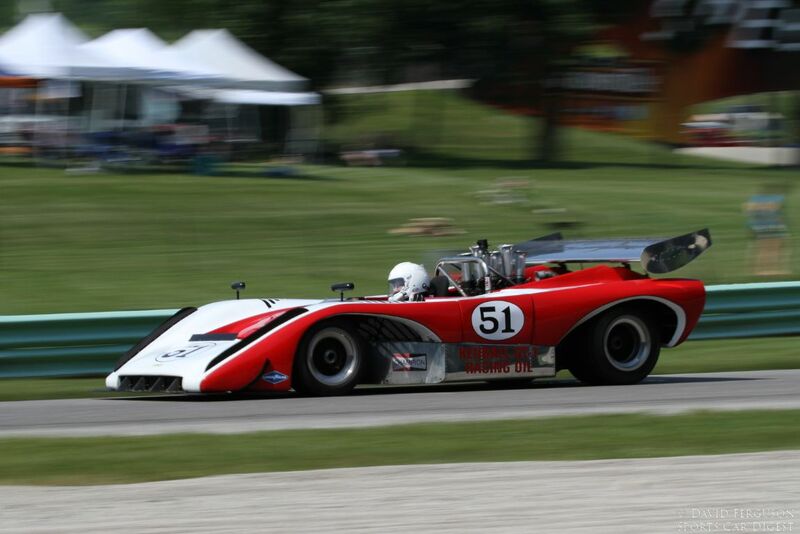 Craig Bennett in his 1974 Shadow DN4 could have challenged for the win, but mechanical problems prevented him from racing. 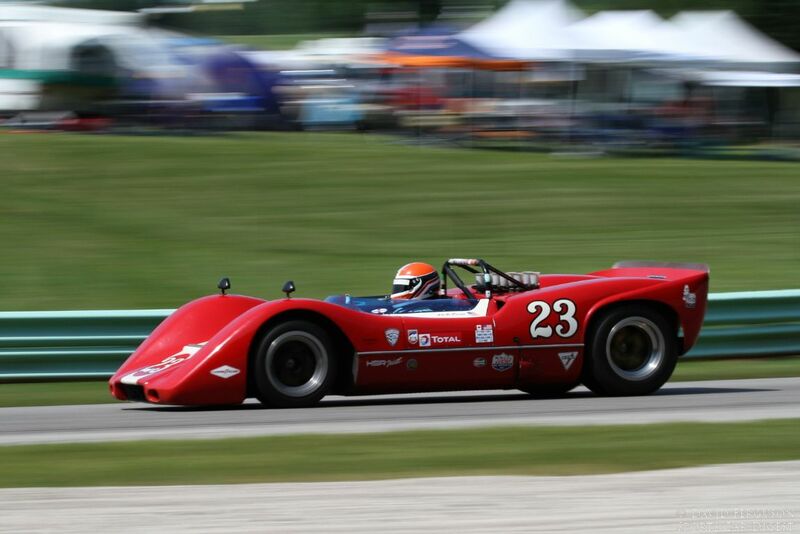 Road America also hosted a reunion to commemorate the 50th Anniversary of the Cheetah. This gathering included the largest collection of Cheetahs in one location (12) as several historic and modern Cheetahs were on display and in competition. Bill Thomas III, son of the original builder of the Cheetah, served as the Cheetah celebration host. 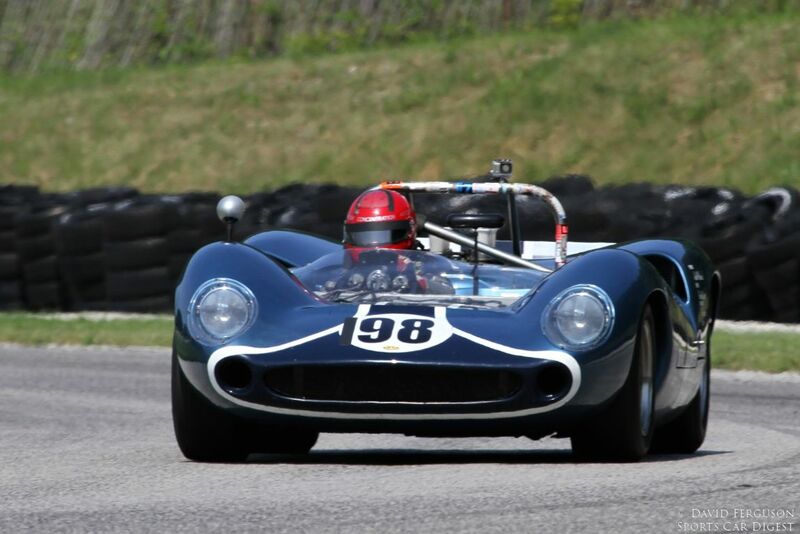 The 440 vintage race cars were divided into twelve groups, providing spectators with plenty of entertainment throughout the weekend. From the Pre-War cars with their tall and skinny tires through some very fast not yet vintage high-tech racers, the diversity of cars was hard to match. Interesting cars included the 1997 Benetton 197 driven by Brian French. This car had the fastest time of the weekend, lapping the track in 1:51.7 minutes, for an average speed of 130 miles per hour (210 kilometers per hour). Other cars of note included August Grasis’ 1953 Allard J2X, Scott Larson’s 1937 Bugatti Type 57, Bud Moeller’s 1980 Ferrari 312 T5, John Delane’s 1971 Tyrrell 002, Andy Boone’s 1968 McLaren M6B ‘McLeagle’, Chris MacAllister’s 1964 AC Cobra, Tony DeLorenzo’s 1958 Scarab Mk I, David Jahimiak’s 1957 Devin Special, Michael Malone’s 1968 Porsche 908, Johan Woerheide’s 1979 Porsche 935 K3 and John Goodman’s 1972 Ferrari 312P Sparling. 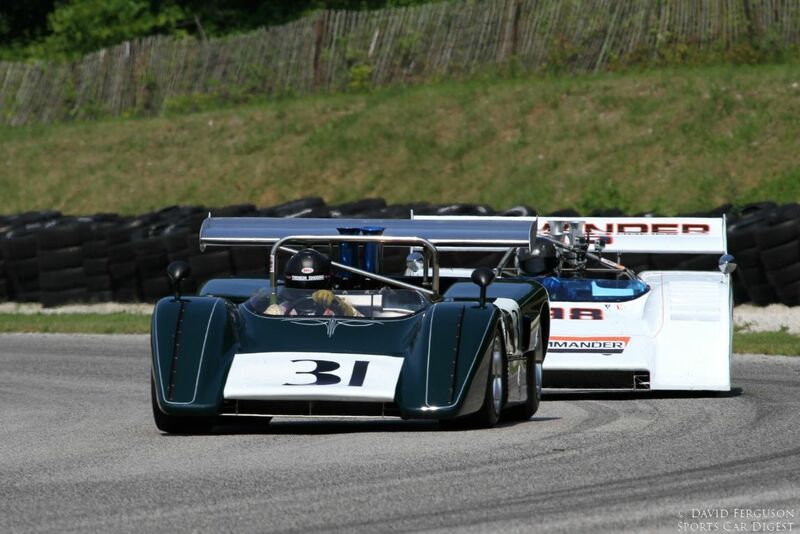 There was so much good racing and great driving throughout the races, but the drive of the weekend happened in the Masters Historic Grand Prix feature. Doc Bundy in a 1978 Lotus 79 had to start at the back of the pack because of a DNF in the qualifying race. He methodically worked his way through the field, passing Chris Locke in a similarly liveried 1976 Lotus 77 in the last lap to win by 0.16 seconds. 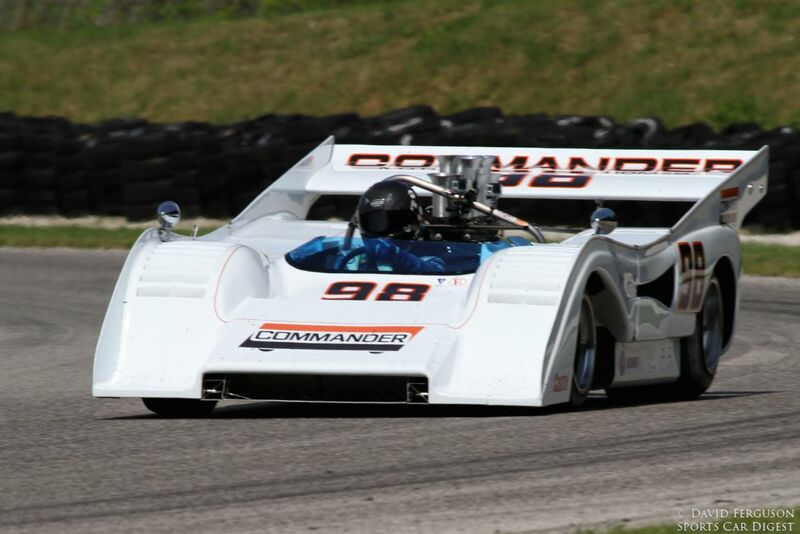 Similar to our 2012 and 2013 race coverage, photographer David Ferguson also documented the 2014 Hawk at Road America with Brian Redman, offering the following picture gallery that shows the strong field of entrants battling each other over the famous road course in Elkhart Lake. We split up David’s pictures into two galleries. The first gallery starting below features our favorite images, all displayed in the full-width view of Sports Car Digest, while the second gallery and race winners can be found on the last page of the article and gives a comprehensive view of all the photographs. Wow! Fantastic shots of so much impressive machinery. Made me want to be there! Love the motion shots that catch the colorful rumble strips. Well done! Great photography; takes me back to what the “June Sprints” used to be like in the before most of these great cars became “Historics”. Amazing photos !!! I love them all, what camera do you use ? ?